We are so proud of Lois Malczewski, one of our certified nursing assistants at our New Berlin campus, for receiving the distinguished Lynn Wege Award from our business partner Optum. Lois received the award last month from Optum, a health services and innovation company with an office in Milwaukee, during an awards ceremony at the LindenGrove New Berlin campus. The award honors the late Lynn Wege who was a nurse practitioner at Optum until she was diagnosed with brain cancer a few years ago. It is presented to just two individuals working in skilled nursing facilities each quarter who show extraordinary compassion, humor, patience and the willingness to teach – all attributes that describe Lynn. 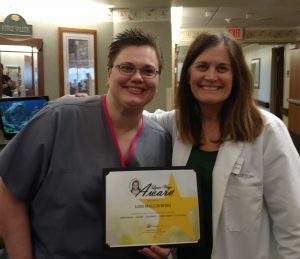 Karen McNerney, a nurse practitioner at Optum, nominated Lois for the amazing job she does caring for our residents. Lois has one of those wonderful, caring personalities where she always puts others first – whether it is staying late or coming in on off days to care for LindenGrove residents, going above and beyond to make residents feel special, especially those who do not have a lot of family or friends nearby, telling jokes and getting others around her laugh often, or just having wonderful conversations. She also goes above and beyond to make sure new nursing assistants receive the best training possible. We completely agree with her. Congratulations to Lois for receiving this distinctive award!